Gingerbread Man Holiday Costume. A gingerbread-inspired dress made of stretch twill with a matte nylon/spandex inset at the center front and back, trimmed with ric rac and adorned with decorative buttons and satin bows. The top skirt is trimmed in ric rac and satin ribbon with a glitter tulle underskirt. 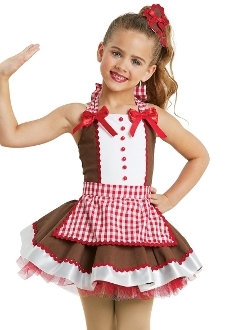 The gingham halter strap matches the detachable apron and attached bows in back. The bodice also has adjustable straps for a custom fit. Attached briefs. Imported. Includes Gingerbread hair clip. Available in Child XS - XL.